Flexible Gravity conveyor for heavier loads - handles up to 376 lbs per lineal feet! Portable skate wheel conveyors are ideal for loading and unloading trailers. Our Flexible conveyors expand up to 60' but then can be contracted to as little as 2' 7" and moved out of the way. Nestaflex portable conveyor will add flexibility to your packaging area and help to increase productivity. Nestaflex is the #1 choice for all packaging applications. 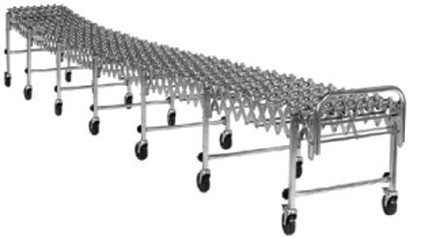 The 376 Flexible conveyors are offered with polymer (black) or steel (silver) skate wheels. You can choose from our 24" wide or 30" wide units. 18" and 36" wide also available, please call for info.